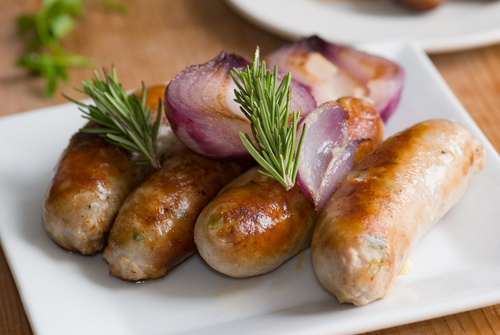 Lamb & Rosemary sausages made from a 100% pure lamb with rosemary, white pepper, sea salt, garlic, onion and iced water. All our sausages are handmade using only the finest organic & rare breed beef. We hang the sausages over night so that the skins shrink around the meat to ensure that when you cook them you get a nice crisp skin on the outside. 8 x Lamb & Rosemary sausages (gluten free) TOP TIP: Cook the lamb & rosemary sausages and cool in the fridge, slice finely and warm up in a tomato pasta.